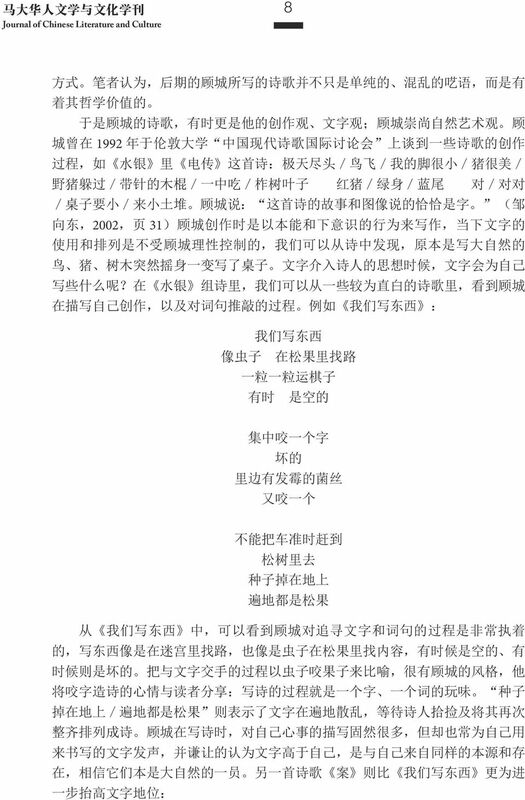 Download "马 大 华 人 文 学 与 文 化 学 刊 Journal of Chinese Literature and Culture 6 前 言 顾 城 曾 在 接 受 德 国 汉 学 家 顾 彬 及 张 穗 子 专 访 中, 将 其 诗 歌 创 作 分 为 四 个 时 期, 即 自 然 阶 段 文 化"
1 5 顾 城 水 银 组 诗 的 水 意 象 解 读 内 容 摘 要 : 意 象 长 久 以 来 扮 演 着 沟 通 人 与 物 之 间 的 桥 梁 在 顾 城 的 诗 歌 中, 意 象 更 发 挥 了 回 归 到 本 身 及 本 质 上 的 功 用 本 文 旨 在 探 讨 顾 城 组 诗 水 银 里 意 象 所 拼 凑 出 来 的 有 关 复 归 本 源 / 自 然 的 命 题 在 顾 城 笔 下, 水 这 个 承 载 了 丰 富 文 化 底 蕴 的 原 型 意 象, 以 无 形 与 混 沌 的 特 质 反 映 了 世 界 本 源 的 面 貌 顾 城 更 以 水 意 象 来 联 系 语 言 的 状 态, 借 此 说 明 万 物 的 本 质 是 同 一 的, 并 展 示 了 回 归 自 然 的 方 法 当 自 我 消 失 在 自 然 之 中, 它 没 有 别 的 去 处, 而 是 与 万 物 合 而 为 一 关 键 词 : 顾 城 ; 水 银 组 诗 ; 水 意 象 作 者 简 介 : 许 怡 怡, 马 来 西 亚 拉 曼 大 学 中 文 系 硕 士 生 廖 冰 凌, 马 来 西 亚 拉 曼 大 学 中 文 系 助 理 教 授 Title: The Water Imagery in Gu Cheng s Group Poems Mercury Abstract: Imagery has always been a bridge that establishes communication between human thoughts and objects around. 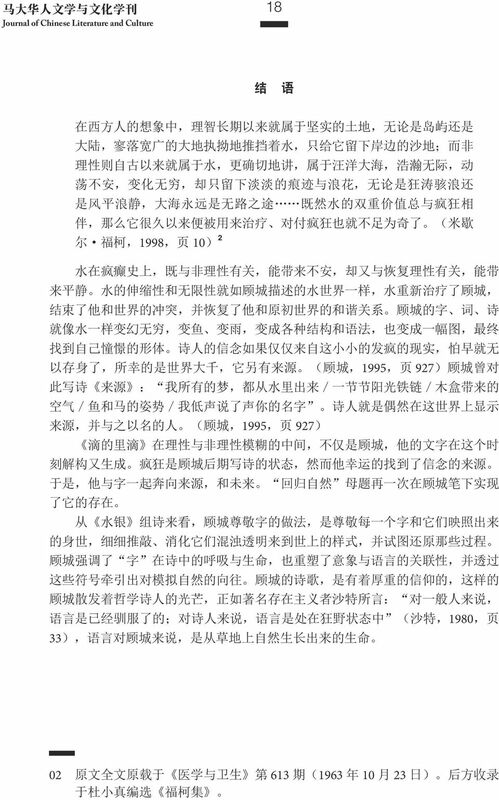 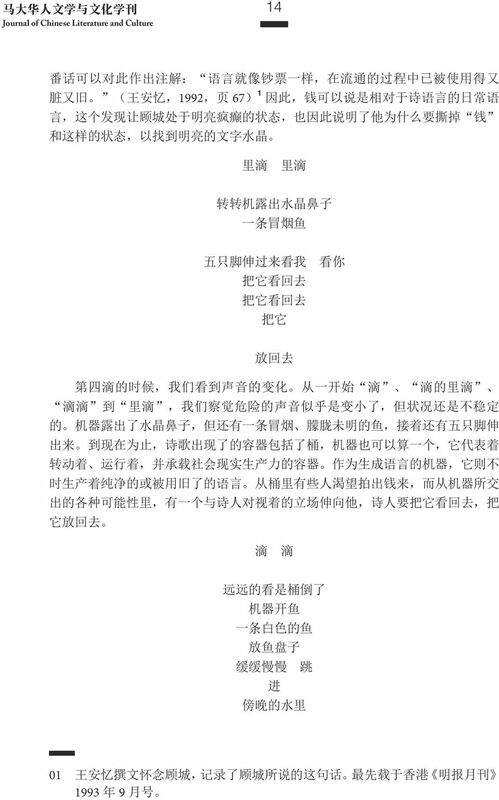 In Gu Cheng s poetry, he lets the imagery function by itself and act as the portrayal of their own essence. 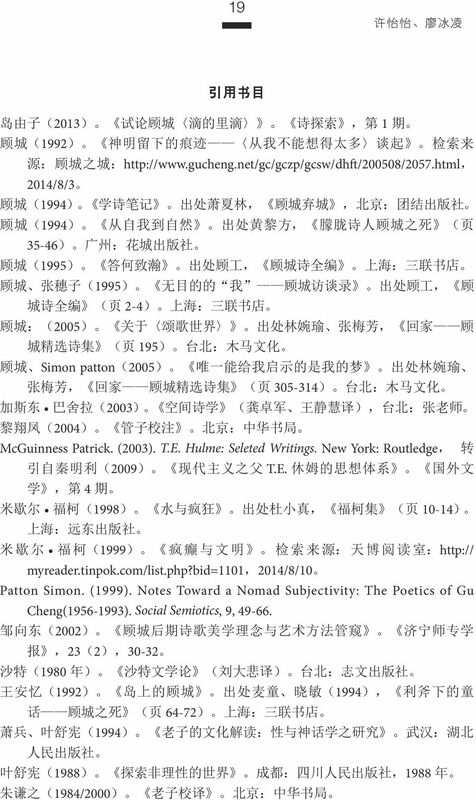 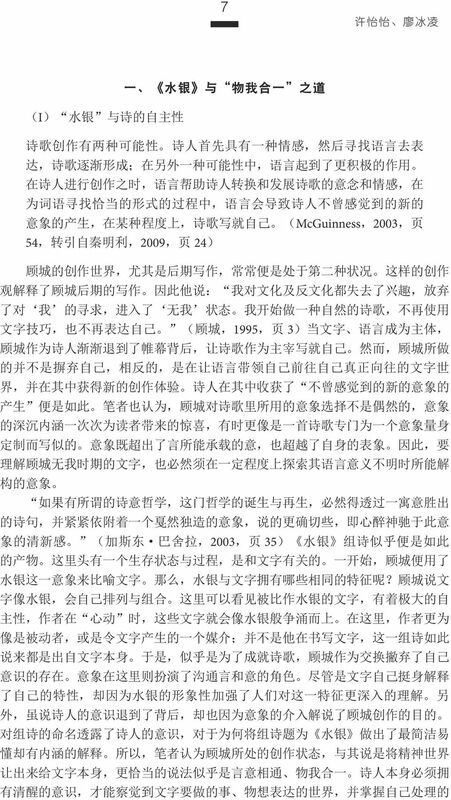 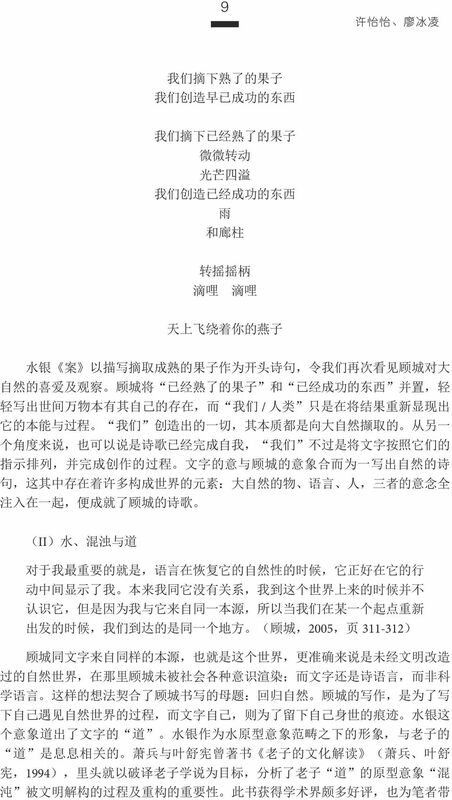 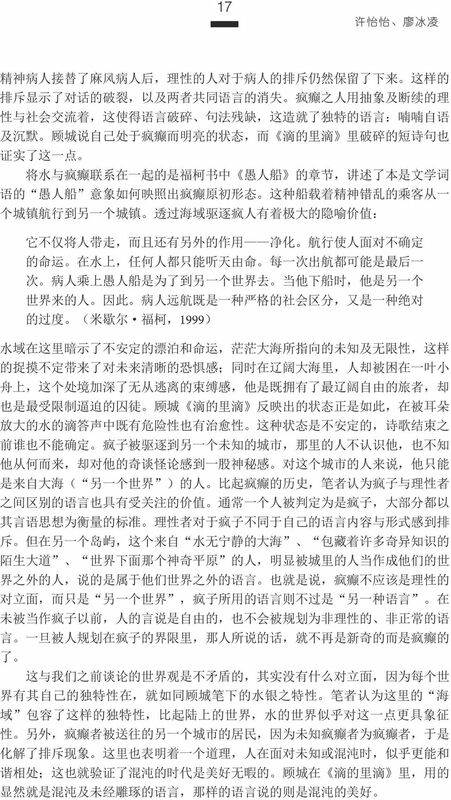 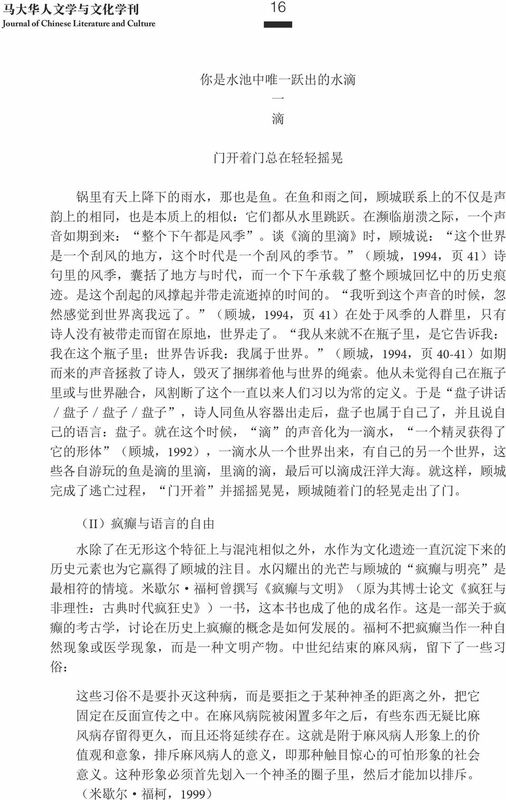 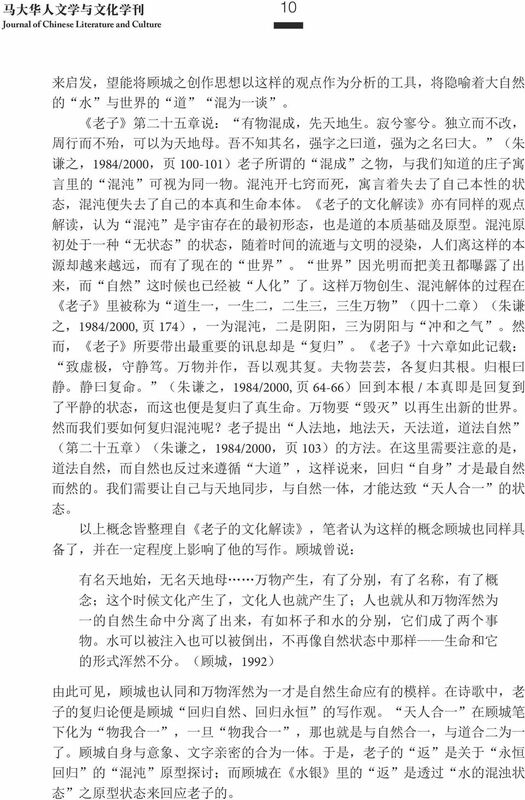 This paper intends to investigate the imagery in Gu Cheng s group poems Mercury that reflects the proposition of return to the origin/nature. 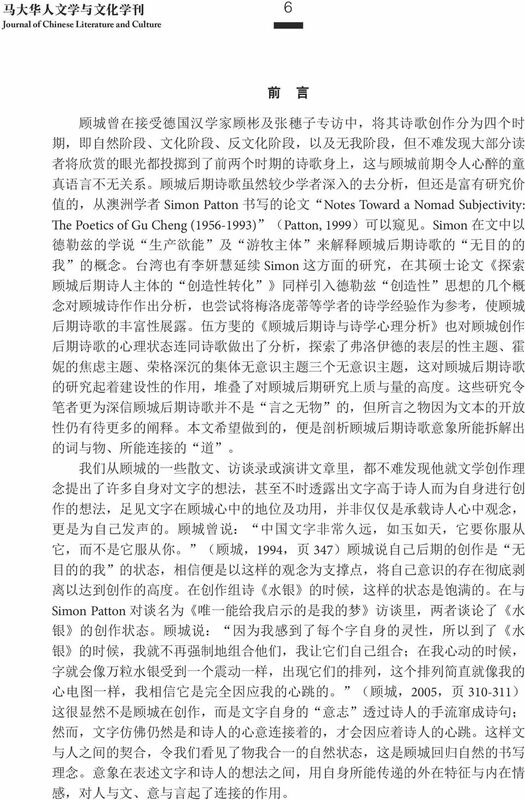 In Gu Cheng s writing, the water archetypal image was selected not only because of the rich cultural heritage the water carried down, its chaos and formless nature which makes it possible to exist in variety forms, also show its suitability to represent the aspect of the origin world. 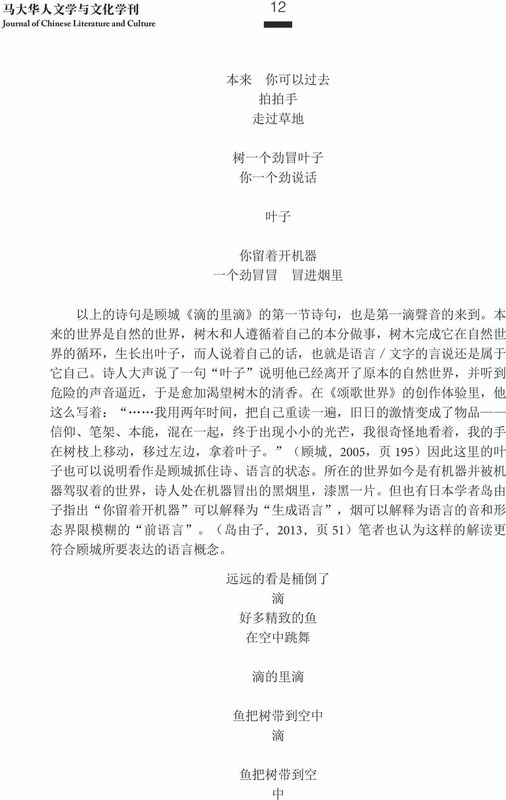 Beyond that, Gu Cheng also related the language mode with the features of water to illustrate the fact that all things are the same in terms of essence, and demonstrates the method to return to the origin/ nature at the same time. 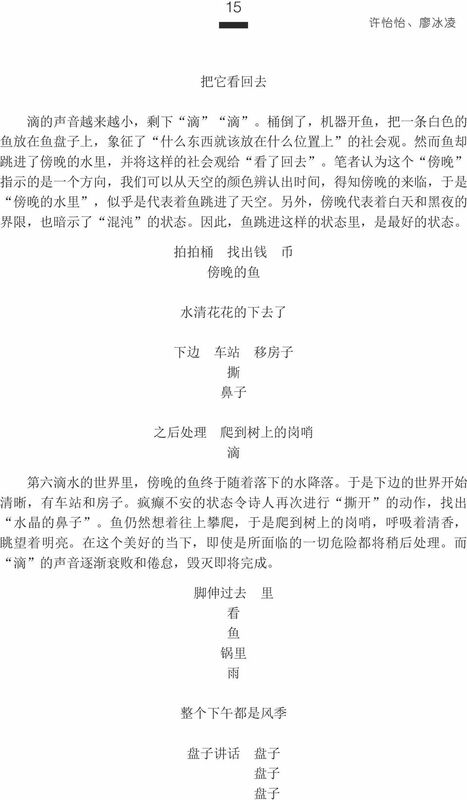 When one s self-consciousness disappears within the nature, one would have no place to turn to but to unite as one with the world. 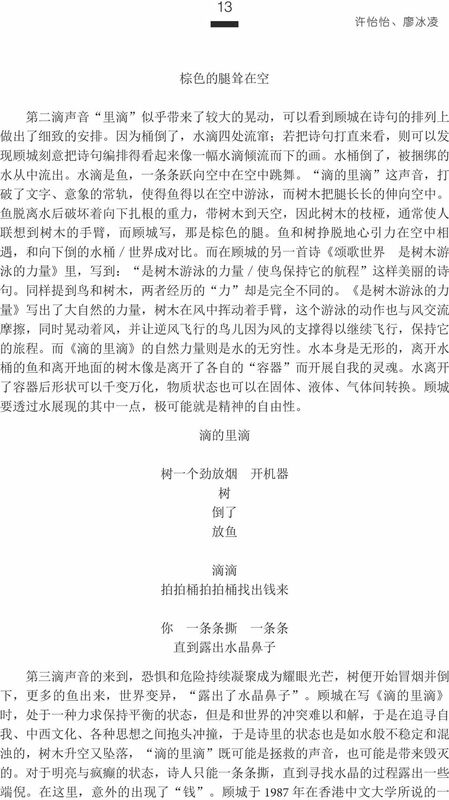 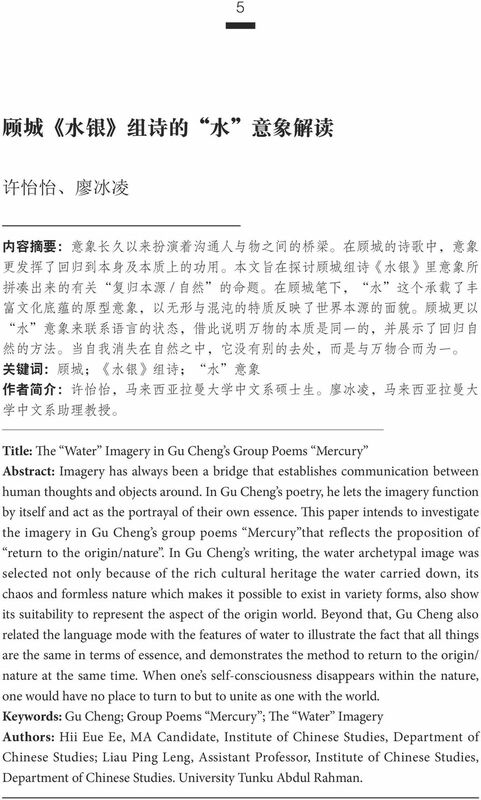 Keywords: Gu Cheng; Group Poems Mercury ; The Water Imagery Authors: Hii Eue Ee, MA Candidate, Institute of Chinese Studies, Department of Chinese Studies; Liau Ping Leng, Assistant Professor, Institute of Chinese Studies, Department of Chinese Studies. 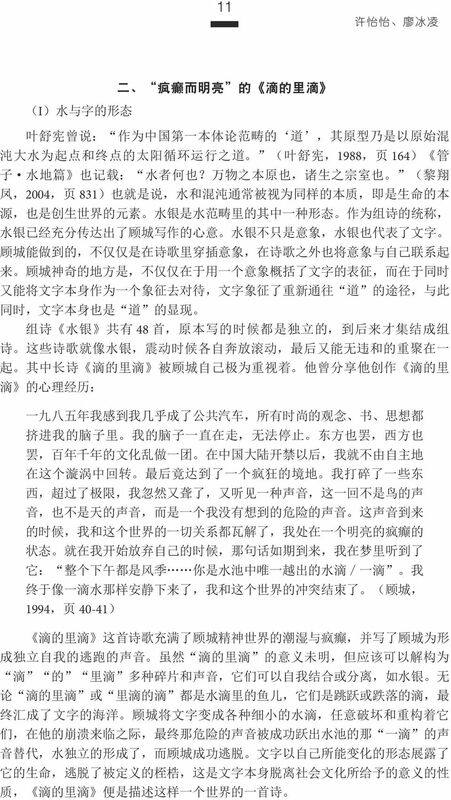 University Tunku Abdul Rahman.